Healthy drains help reduce the amount of contaminants lost in waterways while also optimising soil moisture and improving pasture production, stock health and the habitat for fish and insects. Drains include natural or artificial channels to lower the water table and/or reduce surface flood risk and often make up the majority of lowland waterways. What do healthy drains look like? 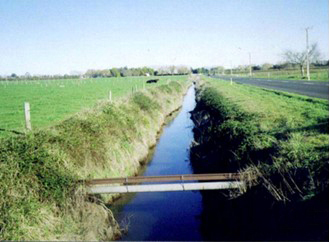 As part of the Sustainable Dairying Water Accord all drains should be included in your farm riparian plan, whether natural, straightened-natural or artificial. Drains require fencing by 31 May 2017 - the only exceptions are drains less than one metre wide and one foot deep. A plan is crucial to all good land management, which includes ensuring resource consent has been obtained before starting work. Before you start any work, contact your regional council for the regional rules about drains. 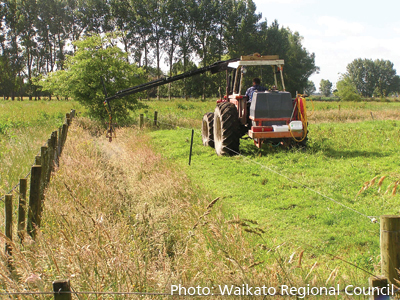 Fencing reduces the need to clear drains by reducing stock treading damage to banks. When fenced, drains often only need cleaning every five to ten years. Fence far enough back to allow for a grass strip to develop. Gently sloping banks (45° or 1:1) reduce sediment loss by letting grass strips grow, improving drainage at low and high flows. A steep bank is more likely to slump into the channel. 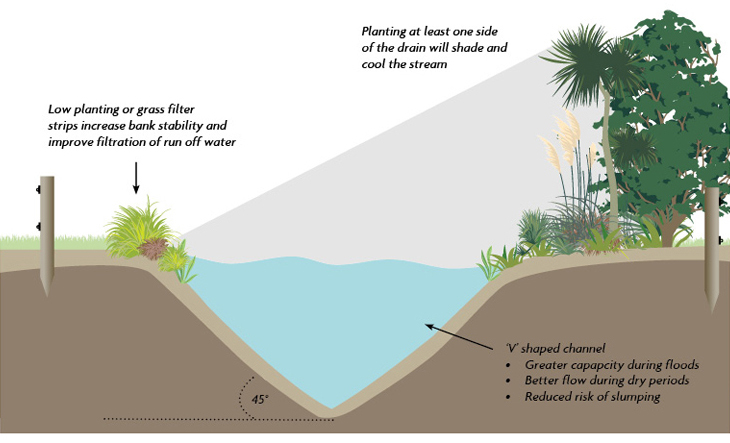 Pasture and native grasses (sedges) are excellent filters of nutrients and sediment in runoff on drain banks, improving water quality and saving money by reducing the need to clear drains. Planting shrubs on the northern bank provides shade to the drain in summer, improving the habitat for fish and insects whilst minimising weed growth in the drain. Leaving one side free of native planting allows for digger access to one side of the drain. Controlling weeds is an ongoing requirement to keeping drains healthy. Spot-spraying instead of blanket spraying is best for weed control. It ensures grasses and desirable plants are kept alive to stabilise banks. Avoid spraying near the waterline to minimise damage to aquatic life. If you have to blanket spray to clear weeds, spray only the centre of the drain so there are still some plants on the bank to prevent erosion. Always apply according to the label and if in doubt check with your regional council. Land drainage areas are mostly regional council-run drainage areas subject to conditions on maintenance, planting and fencing. Contact the regional council to see if any of your waterways are part of a land drainage scheme. Practical approaches to waterway management.